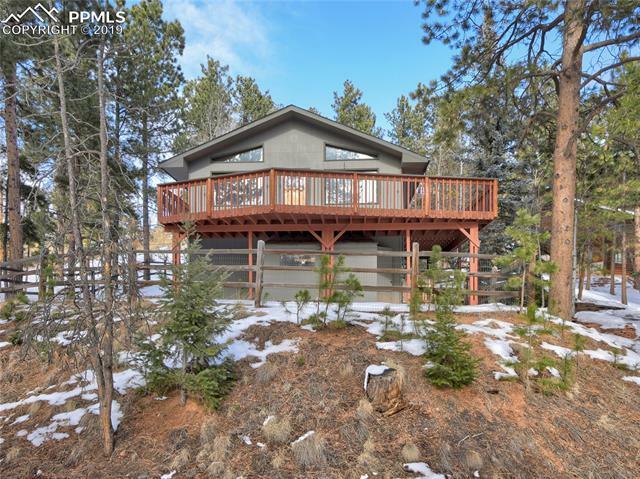 Here's your classic mountain cabin with a warm, sunny, southern exposure, gorgeous stone fireplace with Lopi insert and glimpses of Pikes Peak from the front deck. The wooded lot offers privacy, shade and habitat for wildlife friends while the fenced yard keeps your pets safe at home. Plenty of storage in the oversized garage, a convenient shed under the deck and multiple extra closets inside the home. Large wrap-around deck adds over 400 sq ft of outdoor living space. Close to world class fishing, hiking, skiing and more.